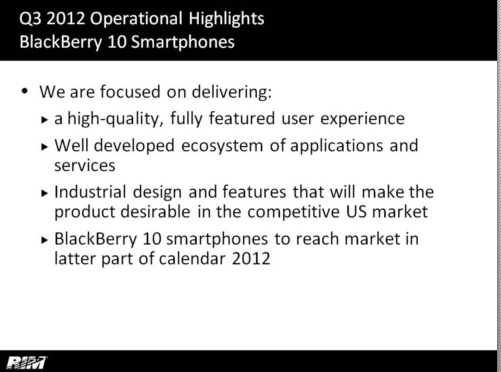 It's Official: First BlackBerry 10 Smartphones Won't Be Available Until Late 2012! Yep, so RIM's Co-CEO's Jim Balsillie and Mike Lazaridis just dropped a big bombshell on tonight's RIM Earnings Call that CrackBerry Nation did not want to hear. The official word is that RIM wants to put a chipset into the USA-bound LTE BlackBerry 10 phones that will not be available until mid-2012. This pushes the rollout of the first BlackBerry 10 phones into the latter part of 2012. Mike Lazaridis followed up with clarification, adding they need this chipset in order to deliver the efficiency and battery life that customers expect from a BlackBerry.